Sylvester McCoy is the Doctor in The Fires of Vulcan. I’ve always believed that there are no bad Doctors, and there are no bad companions. There’s just bad writing. Brought into the series during The Trial of a Time Lord serial Terror of the Vervoids without any sort of proper introduction or initial meeting with the Doctor, Melanie “Mel” Bush was an intelligent computer programmer who was as honest as the day was long. At least, that’s what we were told. What we saw on screen, sadly, was a health nut who made the Doctor exercise and drink carrot juice and a screamer who could tear the paint off the walls with just her voice. Bonnie Langford’s character had a hard time clicking with the fanbase, and her presence in some of the weaker serials (weak due to the troubled production during the switch from Colin Baker to Sylvester McCoy) didn’t provide much assistance. Her departure at the end of Dragonfire, coinciding with the introduction of Ace, was done with little fanfare. Langford, I felt, did the best with what she was given, but it ended up that she was just the wrong actress at the wrong time. Fast forward to 2000, and the release of The Fires of Vulcan, Mel’s first (and thankfully not the last!) Big Finish audio play alongside Sylvester McCoy. With a great script by Steve Lyons and a strong supporting cast, this serial gives both Langford and McCoy a chance to shine, playing a little bit against type while expanding their characters and setting the stage for an old-but-new grand partnership. August 23, 79 AD. The TARDIS lands in Pompeii, a bustling Roman port city, during a grand feast. Even as Mel wishes to explore the city, the Doctor realizes something is wrong. In the distance, where the citizens of Pompeii believe that Vulcan is giving his approval and blessing to the city, Mount Vesuvius begins to boil over. In 24 hours, the city will be buried under nearly six feet of volcanic ash and lava. As the pair try to leave the city, however, they find that an earthquake has buried the TARDIS under a large pile of rubble that will takes days to move. While Mel tries to look on the bright side, the Doctor realizes that, after all his centuries of travel, the end is upon him. For in two thousand years, UNIT archaeologists will dig up the TARDIS from the ruins of Pompeii, a sight that the Doctor himself has seen in his fifth incarnation. Trapped in his own timestream, the Doctor prepares for the worst, even as Mel defies him in an effort to fight fate. Throw in a case of misunderstanding as Mel and the Doctor are mistaken for messageners from the goddess Isis, which upsets the power-hungry High Priestess, a city councilman seeking to advance his own standing, and one very pissed-off gladiator, and then top it all off with the looming threat in the distance. I have to start with Bonnie Langford, which is not meant to be a slight in any way on the great job done by McCoy. Coming back to the role of Mel Bush for the first time in over a decade, instead of the hyper-perky banshee, Langford gives a simply amazing performance. The enthusiasm has been turned down, the optimism has been sanded to remove the sharp spots, the spine has been stiffened, and Langford wrings every single drop of drama out of the script that she can without oversaturation. She plays up the “fish out of water” scenario, at one point being called a harlot for having her hair uncovered and trying to explaining to Roman slaves why they didn’t have to listen to their masters when their very lives were at stake. She plays up the humor aspect as well (“Sorry, I’m a vegetarian.” “I’ve never heard of that province. Vegetaria?”), but when the situation calls for it, such as being arrested just hours before the volcano is set to blow, her cries are heart-wrenching. And when the Doctor has given up hope, it’s Mel who refuses to simply quit. And it’s all believable as well; instead of being all over the place like an emotional ping-pong ball, Langford carries the listener along with her as she struggles with her, and the city’s, impending doom. Her quiet reaction at the end of episode three, when she realizes the seagulls have left Pompeii, is simply haunting. The Seventh Doctor came off as a buffoon, the clown jester who couldn’t find his own hat if you handed it to him, but when the time called for it, unveiled a keen mind that kept him three steps ahead of his foes. But what happens when you’ve reached the end and there’s nothing you can do about it? Sylvester McCoy’s gives a performance just as solid and provoking at Langford’s as a Time Lord who believes it’s the end and the moment is NOT prepared for. For the first episode, he’s his normal self, putting Mel up at collateral in order to win some money from a cheating gladiator, but once he realizes that destiny is locked in and he can’t simply step into the TARDIS and leave Pompeii, the wit and cheer quickly vanish, leaving behind a morose, listless Doctor whose attempts to save himself and Melanie are half-hearted at best. Several times, the listener does want to slap some sense into the Doctor, but McCoy plays for sympathy, not pity. And when he does get his determination back and time attempts to reassert itself, he steps up and saves not only himself, but someone else in the process. Again, instead of “emotional ping-pong,” McCoy’s changes in mood and character are natural and organic. 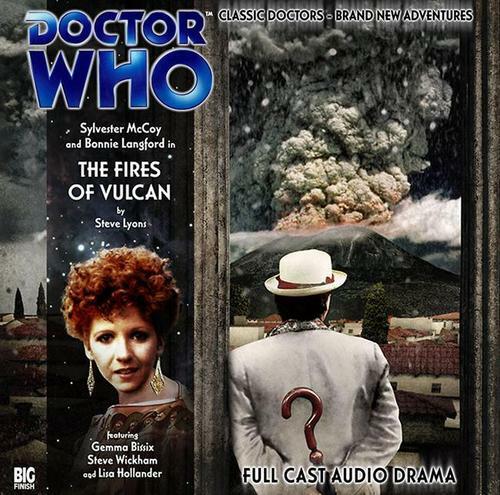 Much as The Marian Conspiracy was a throwback to the old historical serials of William Hartnell, The Fires of Vulcan is a throwback as well; no aliens here (well, when Ten and Donna visit in The Fires of Pompeii, but that’s not here nor there), but plenty of religious intrigue and threats upon the Doctor’s life. Isis was an Egyptian goddess brought to Pompeii after that civilization’s assimilation by Rome, and the TARDIS’ arrival was seen by two of her clergy – Celcinus, played by Andy Coleman, and Eumachia, played by Lisa Hollander. The pair play their parts perfectly – Eumachia believing that her goddess will grant her power to not only destroy the Doctor and Mel, but to also survive the oncoming eruption, while Celcinus is more pragmatic and honest, doing his best to do what’s right while serving his goddess. Their reactions during the fourth episode are in character and done very well. Steve Wickham deserves praise as the gladiator Murranus, who is caught cheating by the Doctor and spends the rest of the story trying to find him and kill him. He is loud, bombastic, and every inch the cocky Roman gladiator. The script is deserving of high praise, the highest actually. 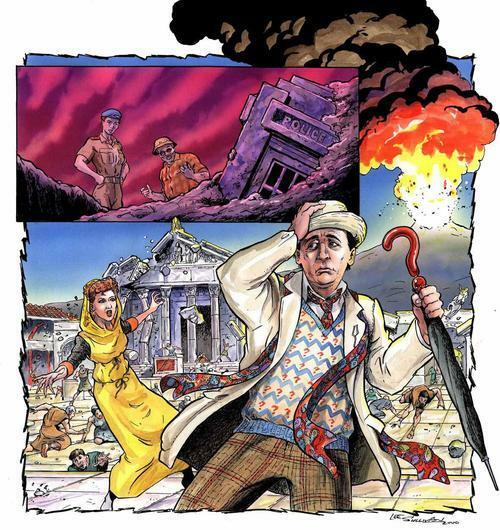 Done by Steve Lyons, author of several Doctor Who novels and several Big Finish productions (including the upcoming Colditz co-starring David Tennant), the script mixes humor, action, and high drama, all of those aspects heated together and forged into a strong story. The cliffhangers are well done, especially the second and third episode endings. Roman life is well represented, as Mel remembers her Latin to read some graffiti, and a scene were Mel accidentally enters a brothel is a crowd pleaser. It’s one of the best scripts so far, especially the final explanation of just how the TARDIS got to where it was, two thousand years later. And the direction. When Vesuvius erupts with a thunderclap, the sound takes over. The screams of the fleeing population, the rain of ash pounding against stone roofs, the collapsing ceilings. Even the early episodes, with the seagulls, Roman citizens, children splashing in the baths…there’s one part, where a goat is sacrificed to Isis, that is particularly well done, even as it’s very cringing to hear. Final Synopsis – One of the best Big Finish audios, The Fires of Vulcan shows what happens when a Doctor can’t outrun time. A great script, amazing audio, and a performance by Bonnie Langford that just knocks it out of the park. 5/5. Next up – The TARDIS lands in a forbidding castle in a time of religious upheaval. The old god has been overthrown, and all heretics are to be slaughtered. Obviously it isn’t the sort of thing which would happen there every day – just every few years or so. Colin Baker as the Doctor in…The Holy Terror.